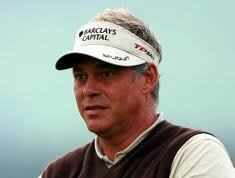 There was a wonderful shot of Darren Clarke during the third round yesterday on ESPN. It pictured him dragging on a cigarette while standing to the side waiting for his partner too play. He looked like a middle aged overweight schlump,out for an afternoon stroll and hitting a few golf balls. He certainly didn't look like the man leading the British Open. As the ESPN commentator noted, when you talk about six packs and Darren Clarke, you are not talking about abs. Which makes Clarke,overweight, a smoker, a joker who loves to kid around a rare bird in the world of sport. He is the best everyman since John Daly with his massive weight problems,four or five wives, drink issues and much more became a crowd darling. I remember being at a US Open some years ago and seeing the crowd reaction to Daly who was a superhero for them. Clarke is the same and if he manages to lift the claret jug at the end of today's open he will have struck a mighty blow for all couch potatoes. Clarke has battled a tragic home life when his first wife Heather, died with grace and dignity and is a man who has experienced life's up and downs. It is reflected in his paunch, his grey hair and his well lined face. Here's wishing him luck in his final round. It would be great to have an ordinary Joe winner.